HNS AC $420 BioPureSPE Mini 96-Well Graphite, 5-200µg capacity, 20mg, ea. HNS AC-M $500 BioPureSPE Midi 96-Well Graphite, 12-500µg capacity, 50mg, ea. HNS AC-MX $540 BioPureSPE Hybrid 96-Well Graphite, 5-500µg capacity, 50% 20mg & 50% 50mg, ea. 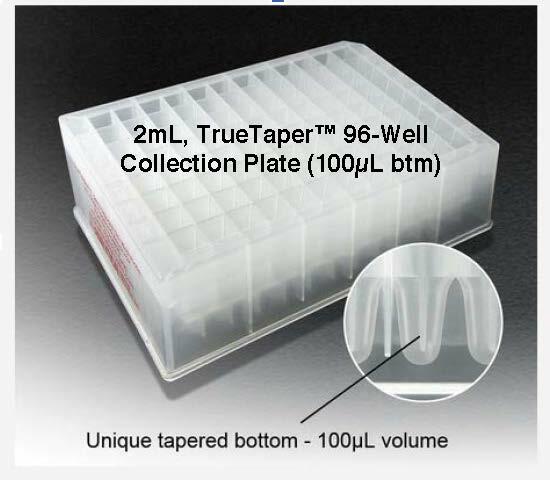 AS 968820EA $5.80 2mL TrueTaper Square Top, 96 Well Collection Plate (100µL bottom), 43mm height, ea. 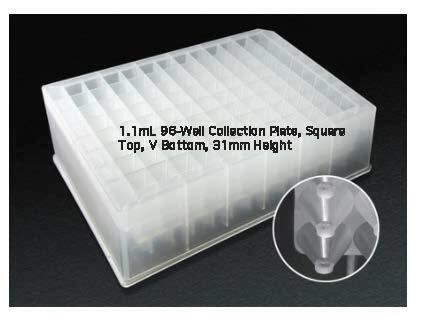 AS 960026EA $5.80 1.1mL Sq Top /w V Bottom, 96-Well Collection Plate, 31mm height, ea. HNS S04V $210 BioPureSPE Mini-96-Well, PROTO 300 C4, 7-70µg max capacity, 0.2ml, 20mg, 300Å, ea. HNS S04V-M $220 BioPureSPE Midi-96-Well, PROTO 300 C4, 17-170µg max capacity, 0.2ml, 50mg, 300Å, ea. HNS S04V-MX $290 BioPureSPE Hybrid-96-Well, PROTO 300 C4 17-170µg & 35-350µg max capacity, 0.2ml, 50% 50mg & 50% 100mg, ea. HNS S04V-L $280 BioPureSPE Macro-96-Well, PROTO 300 C4, 35-350µg max capacity, 0.2ml, 100mg, 300Å, ea. 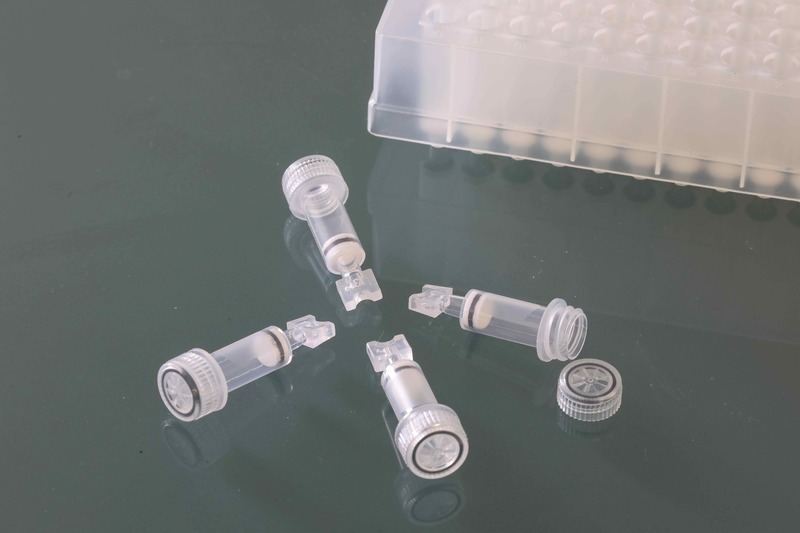 HNS S18V-MXS $300 BioPureSPE Scout-96-Well, PROTO 300 C18 7-70µg, 17-170µg & 35-350µg max capacity, 0.2ml, 20mg, 50mg & 100mg, ea. 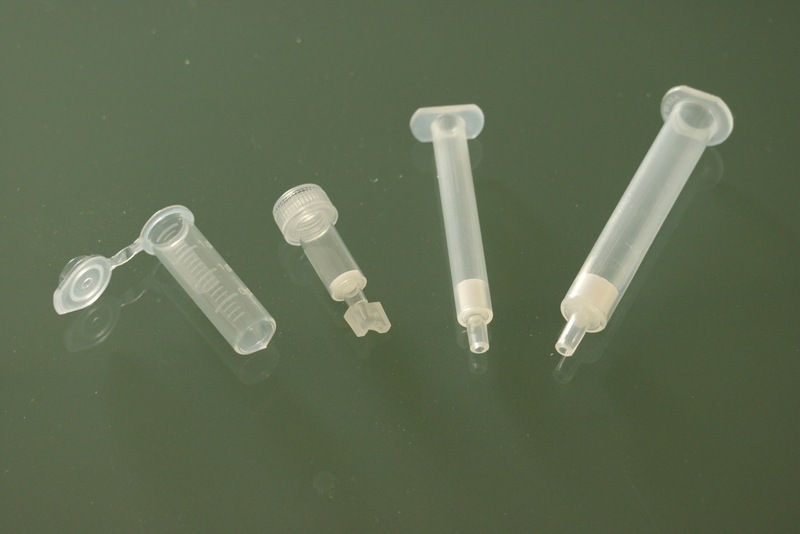 HNS S18V $210 BioPureSPE Mini-96-Well, PROTO 300 C18, 7-70µg max capacity, 0.2ml, 20mg, 300Å, ea. HNS S18V-M $220 BioPureSPE Midi-96-Well, PROTO 300 C18, 17-170µg max capacity, 0.2ml, 50mg, 300Å, ea. HNS S18V-MX $290 BioPureSPE Hybrid-96-Well, PROTO 300 C18 17-170µg & 35-350µg max capacity, 0.2ml, 50% 50mg & 50% 100mg, ea. HNS S18V-L $280 BioPureSPE Macro-96-Well, PROTO 300 C18, 35-350µg max capacity, 0.2ml, 100mg, 300Å, ea. HNS S18R-MXS $300 BioPureSPE Scout-96-Well, TARGA C18 7-70µg, 17-170µg & 35-350µg max capacity, 0.2ml, 20mg, 50mg & 100mg, ea. 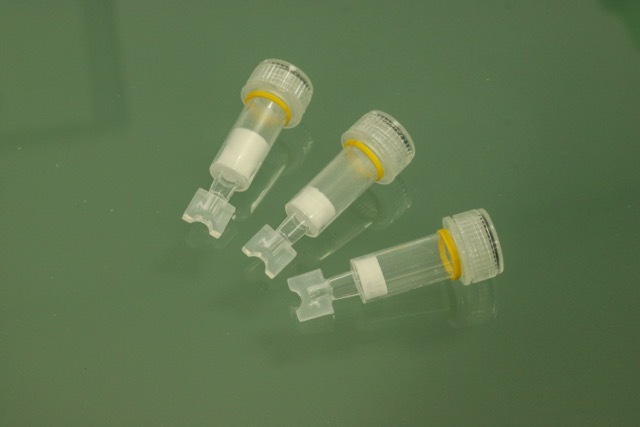 HNS S18R $210 BioPureSPE Mini-96-Well, FastEq, TARGA C18, 7-70µg max capacity, 0.2ml, 20mg, 300Å, ea. 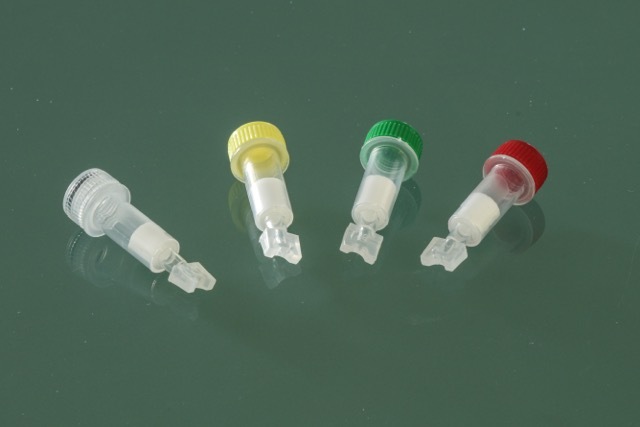 HNS S18R-M $220 BioPureSPE Midi-96-Well, FastEq, TARGA C18, 17-170µg max capacity, 0.2ml, 50mg, 300Å, ea. HNS S18R-MX $290 BioPureSPE Hybrid-96-Well, FastEq, TARGA C18 17-170µg & 35-350µg max capacity, 0.2ml, 50% 50mg & 50% 100mg, ea. HNS S18R-L $280 BioPureSPE Macro-96-Well, FastEq, TARGA C18, 35-350µg max capacity, 0.2ml, 100mg, 300Å, ea. HNS HIL-SCX-L $540 BioPureSPE 96-Well MACRO Plate, 100mg, 300Å, PolySULFOETHYL A HILIC-SCX 0.2-1mg/35-350µg capacity, 50-200µL, ea. HNS HIL-PSA-L $450 BioPureSPE 96-Well MACRO Plate, 100mg, 120Å, "PSA" (Primary Secondary Amine) ERLIC-WAX 0.2-1mg/35-350µg capacity, 50-200µL, ea. HNS HIL-WAX-L $540 BioPureSPE 96-Well MACRO Plate, 100mg, 300Å, PolyWAX LP HILIC-WAX 0.2-1mg/35-350µg capacity, 50-200µL, ea. HNS HIL-WCX-L $540 BioPureSPE 96-Well MACRO Plate, 100mg, 300Å, PolyCAT A HILIC-WCX 0.2-1mg/35-350µg capacity, 50-200µL, ea. 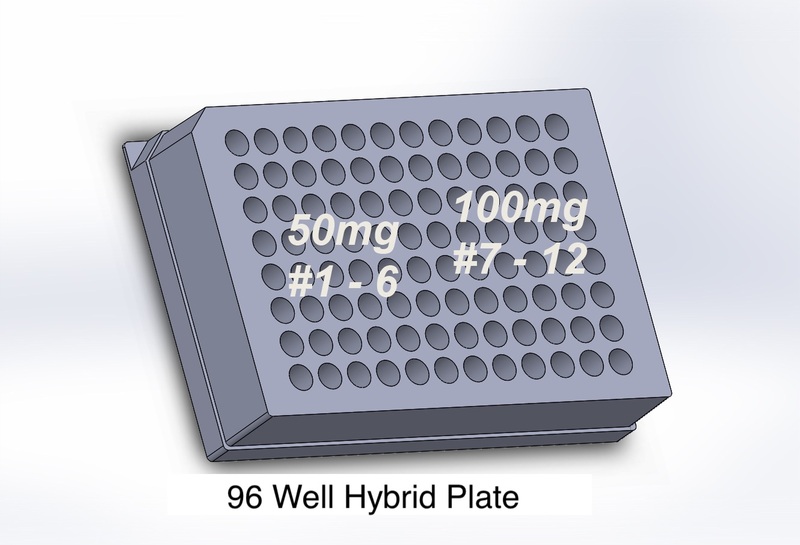 HNS HIL-SCX-M $500 BioPureSPE 96-Well Midi Plate, 50mg, 300Å, PolySULFOETHYL A HILIC-SCX 100-500µg/17-170µg capacity, 50-200µL, ea. 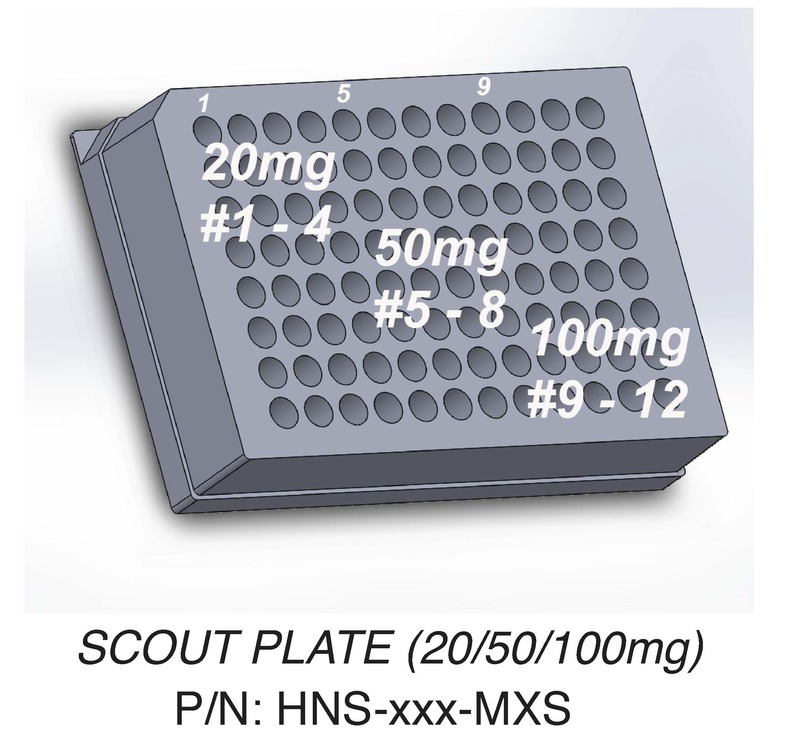 HNS HIL-PSA-M $430 BioPureSPN Midi Plate, 50mg, 120Å, "PSA" (Primary Secondary Amine) ERLIC-WAX 100-500µg/17-170µg capacity, 50-200µL, ea. HNS HIL-WAX-M $500 BioPureSPE 96-Well Midi Plate, 50mg, 300Å, PolyWAX LP HILIC-WAX 100-500µg/17-170µg capacity, 50-200µL, ea. HNS HIL-WCX-M $500 BioPureSPE 96-Well Midi Plate, 50mg, 300Å, PolyCAT A HILIC-WCX 100-500µg/17-170µg capacity, 50-200µL, ea. HNS HIL-PSA $410 BioPureSPE Mini Plate, 20mg, 120Å, "PSA" (Primary Secondary Amine) ERLIC-WAX 40-200µg/7-70µg capacity, 20-100µL, ea. HNS HIL-WAX $480 BioPureSPE 96-Well Mini Plate, 20mg, 300Å, PolyWAX LP ERLIC-WAX 40-200µg/7-70µg capacity, 20-100µL, ea.